Award for exemplary dedication to the energy transition with the internal photovoltaic system. TELE has received an award for exemplary dedication to the energy transition with its internal photovoltaic system. TELE Haase Steuergeräte GmbH was awarded the Austrian Solar Prize 2012 by Eurostar Austria in the category of “Industrial, Commercial and Agricultural Companies” for its internal photovoltaic system. The photovoltaic system, which is one of the largest in Vienna, provides the manufacturing company with roughly 25% of its energy needs. The Austrian Solar Prize was awarded for the 18th time and this year was presented under the patronage of the Carinthian provincial governor Gerhard Dörfler in Kötschach-Mauthen. We are the Austrian market leaders and a pioneer in the field of monitoring and control technology, and we generate roughly 6 MWh of electricity per year with the 72 kWp photovoltaic system that was honoured with this award. 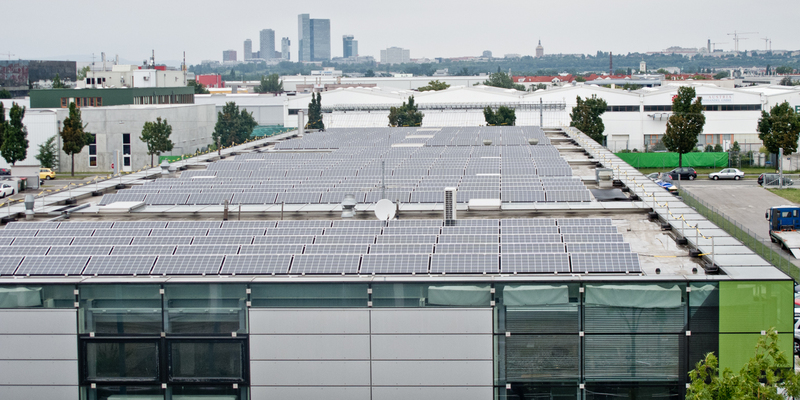 We created a new foundation for our energy supply in 2011 and installed what was then the largest photovoltaic system in Vienna on the roof of our headquarters. With over 300 solar modules providing a pure collector area of more than 500 square metres, the solar power plant provides the electricity for the air conditioning as well as part of the energy for the production process. The internal photovoltaic system will also reduce costs in the future: The investment should pay for itself as early as 2018. After that, TELE will save roughly EUR 10,000 in energy costs each year.